Illusione has been on a roll lately. The recently released 2014 Singulare Anunnaki earned a rare five-stogie rating. It is the first Singulare that’s in the same class as the original 2010 Singulare, as good and possibly even better depending on how it ages. And the last new full line from Illusione, the Fume d’Amour, was another outstanding release. In addition to both being good smokes, both the Anunnaki and Fume d’Amour fall in the mild- to medium-bodied range. For that reason, I was particularly interested to try Illusione’s ~eccj~ 20th Annicersary cigar. 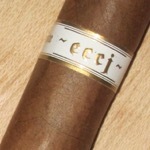 The original ~eccj~ debuted in 2008 to celebrate the 15th Anniverary of the European Cigar Cult Journal magazine, now just called Cigar Journal. That cigar blend, which gained a bit of a cult following, would become the popular Epernay line. So, naturally, when Illusione brand owner Dion Giolito announced a follow-up ~eccj~ would be coming, it was eagerly anticipated. The new ~eccj~ features a tweaked blend and a slightly larger size (6.5 x 48). Boxes of 15 sell for $195, or $13 per cigar. Using 100% Nicaraguan tobacco, including a Café Rosado Corojo ’99 wrapper, the ~eccj~ 20th Anniversary features some sneaky strength. The flavors are a complex combination of roasted nuts, breadiness, light oak, leather, and cream. The strength builds towards a solid-medium, bordering on medium-full as it progresses, though the flavors don’t change much. There is a slightly sour edge that particularly lingers on the finish. While it’s an excellent cigar, it might suffer from the obvious comparison to other Illusione cigars. For my tastes, it isn’t as refined as the Epernay, Fume d’Amour, or the most recent Singulare. But don’t let that high bar fool you. With sneaky flavor, complexity, and good construction, plus the potential to get better with more age, the Illusione ~eccj~ 20th earns a rating of four stogies out of five.